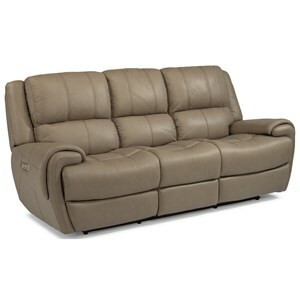 Providing you with a slightly more modern, yet still timeless style, this highly functional power reclining sofa will become your go to spot to relax after a long day at the office. Pillow arms and a high density seat cushion offer an excess of comfort for you to sink in to every night, while power headrest, lumber, and infinite number of reclining positions ensure that you'll never struggle to relax no matter what activity you are doing. 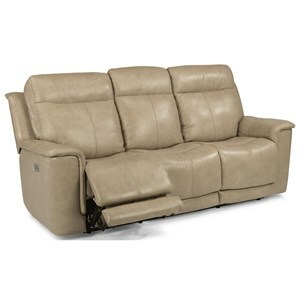 The center console offers two cup holders as well as a convenient space to store remotes or gaming controllers. 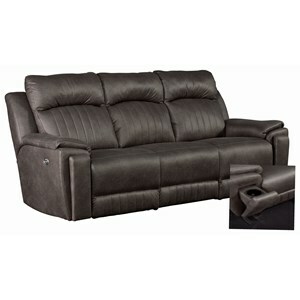 This reclining sofa even offers a USB port on the power control, as well as a home button that allows you to quickly return this seat to its starting position. 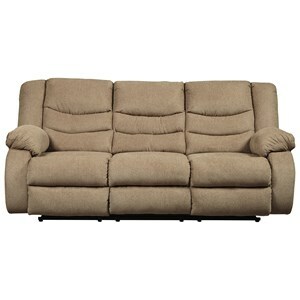 This sofa requires 9" of wall clearance. 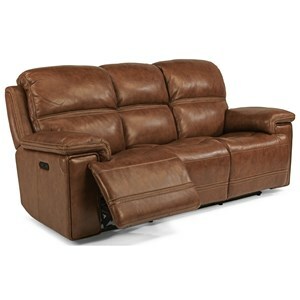 The Latitudes - Elijah Contemporary Power Reclining Sofa With Power Headrest and Lumbar by Flexsteel at Godby Home Furnishings in the Noblesville, Carmel, Avon, Indianapolis, Indiana area. Product availability may vary. Contact us for the most current availability on this product. 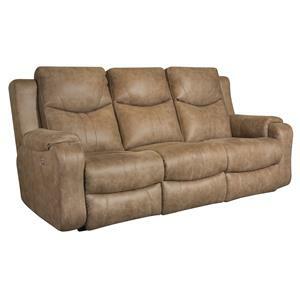 Bring a touch of contemporary style and functionality to your home with this power reclining collection. 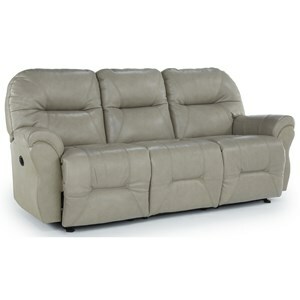 Each item in this collection features comfortably plush pillow arms along with high-density seat cushions to ensure that you'll be able to easily sink into your favorite seat after a long day at work. 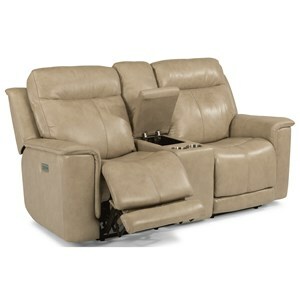 Independently adjustable reclining as well as the power headrest and lumbar mechanisms give you the ability to find the perfect position for you to relax in. Each piece also features a USB port next to the reclining controls, ensuring you'll be able to easily be able to keep your devices charged and near you. The Latitudes - Elijah collection is a great option if you are looking for Contemporary furniture in the Noblesville, Carmel, Avon, Indianapolis, Indiana area. Browse other items in the Latitudes - Elijah collection from Godby Home Furnishings in the Noblesville, Carmel, Avon, Indianapolis, Indiana area.